Updated with latest processors and optional Vega graphics on March 19, 2019. Subscribe for regular MacRumors news and future iMac info. 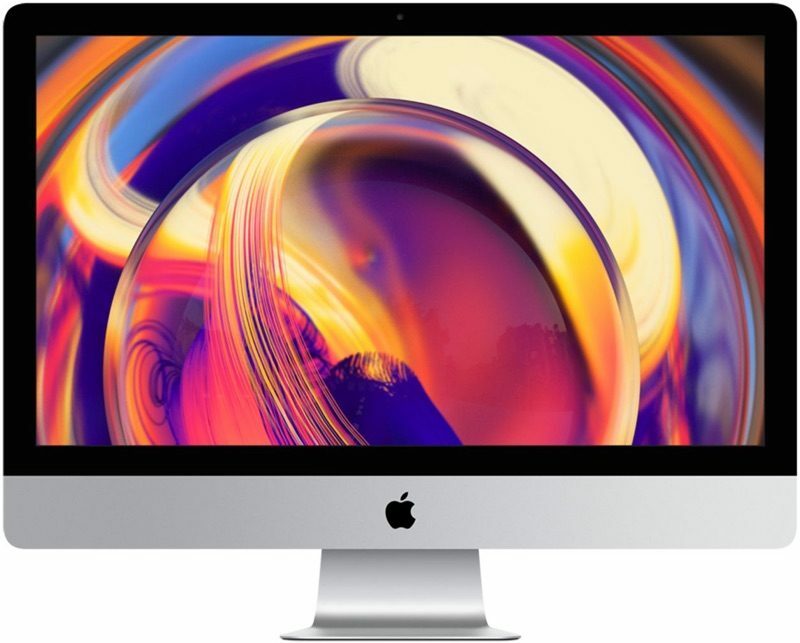 Apple refreshed its iMac lineup on March 19, 2019 after a two-year wait, introducing 8th and 9th-generation Coffee Lake processors and upgraded Radeon Pro Vega graphics options for significant performance improvements over 2017 models. Apple's tagline for this update, is, in fact "freaking powerful." 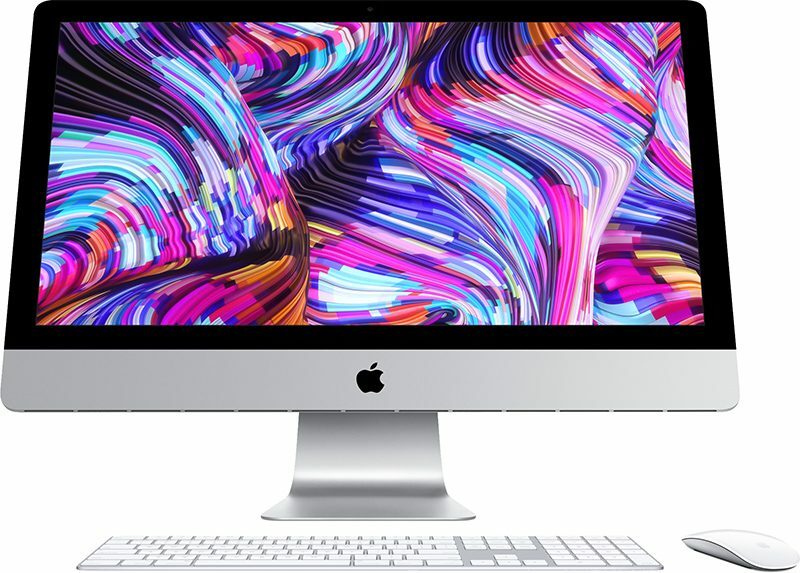 The 2019 iMac update was a spec refresh only, and there were no design changes or external updates. The 21.5 and 27-inch 4K and 5K iMacs continue to use the same "ultra-thin" slim-bodied design that was first introduced in 2012. There were also no updates to the display, which was refreshed in 2017 with what Apple said at the time was the "Best Mac display ever" offering 500 nits brightness and 10-bit dithering for accurate reproduction of up to a billion colors. Apple's 21.5-inch iMacs have been updated with Intel's 8th-generation chips with up to 6 cores at the high end, while the highest-end 27-inch iMacs feature Intel's 9th-generation chips with up to 8 cores. Apple says the 21.5-inch iMac is up to 60 percent faster than the previous-generation model, while the 27-inch iMac is up to 2.4 times faster. For the first time, Apple has introduced Radeon Pro Vega graphics in both the 4K and 5K iMac models. In the 4K Macs, Radeon Pro Vega graphics offer 80 percent faster graphics performance, while in the 27-inch model, the upgraded option provides 50 percent faster graphics performance. These high-end processor and Radeon Pro Vega graphics options are add-on upgrades and will be an additional cost over the base iMac pricing. The 21.5-inch 4K iMac is priced starting at $1,299, while the 27-inch 5K iMac is priced starting at $1,799. All 27-inch models and the higher-end 21.5-inch iMac ship with Fusion Drives as a standard storage option, but they can be upgraded with SSD storage for an additional cost. The entry-level 2019 4K 21.5-inch iMac and the still-available low-end 2K 21.5-inch iMac continue to come with traditional hard drives. Both the base 21.5-inch 4K iMac models can be configured with up to 32GB of fast 2666MHz RAM, while the higher-end 27-inch iMac models can be configured with up to 64GB of 2666MHz RAM. The new iMac models are equipped with two USB-C Thunderbolt 3 ports, 4 USB-A ports, a headphone jack, an SD card slot, and a Gigabit ethernet port. A FaceTime HD camera, stereo speakers, and a microphone are also standard on all models. 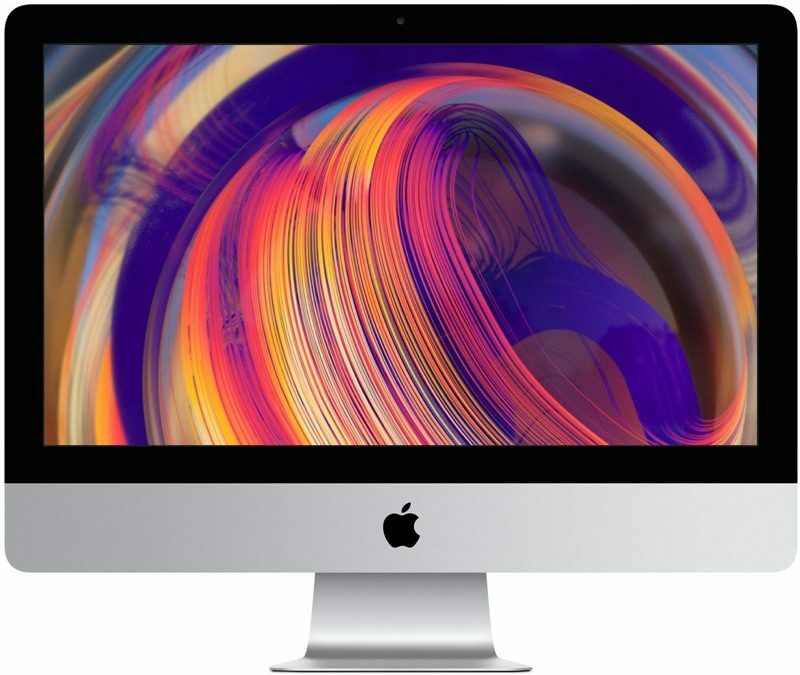 Along with the new 2019 iMacs introduced in March, Apple is continuing to sell a lower-end $1,099 iMac that wasn't updated. This machine features a 2K display and an older 7th-generation processor. Apple also has an iMac Pro aimed at its professional users, and details can be found in our iMac Pro roundup. Apple's iMacs ship with an Apple Magic Keyboard that can be upgraded to a Magic Keyboard with Numeric Keypad for $30 and a Magic Mouse 2 that can be upgraded to a Magic Trackpad 2 for $50. Apple hasn't changed the design of the iMac since 2012, when it introduced the slim unibody design with razor thin 5mm display, aluminum stand, and aluminum border at the bottom of the machine. 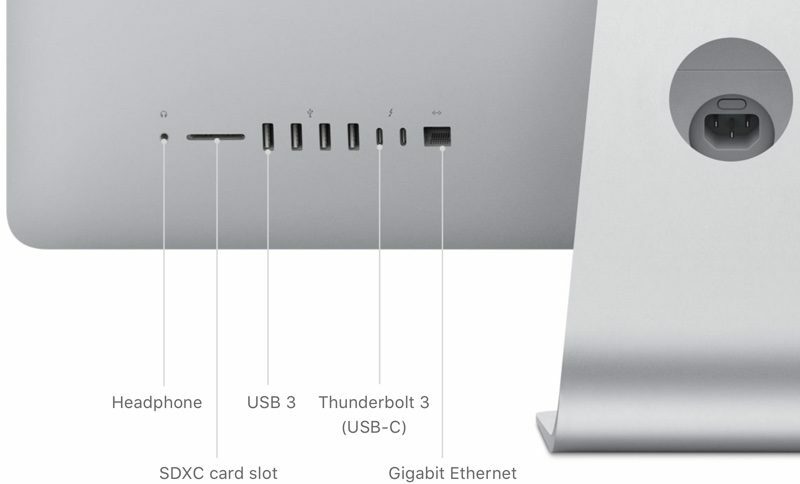 All 2019 iMac models use this design, with a single plug at the back for power and ports at the rear for connecting accessories. On 27-inch machines, there's also a rear hatch for accessing the RAM for upgrade purposes. The 21.5-inch iMac measures in at 17.7 inches tall and 20.8 inches wide, with a stand depth of 6.9 inches and a total weight of 12.5 pounds. The 27-inch iMac measures in at 20.3 inches tall and 25.6 inches wide, with a stand depth of 8 inches and a weight of 20.8 pounds. All iMacs ship with a wireless Apple Magic Keyboard and an Apple Magic Mouse 2, with a Magic Trackpad 2 available as a $50 upgrade option. A wireless Magic Keyboard with Numeric Keyboard is also available for an additional $30. 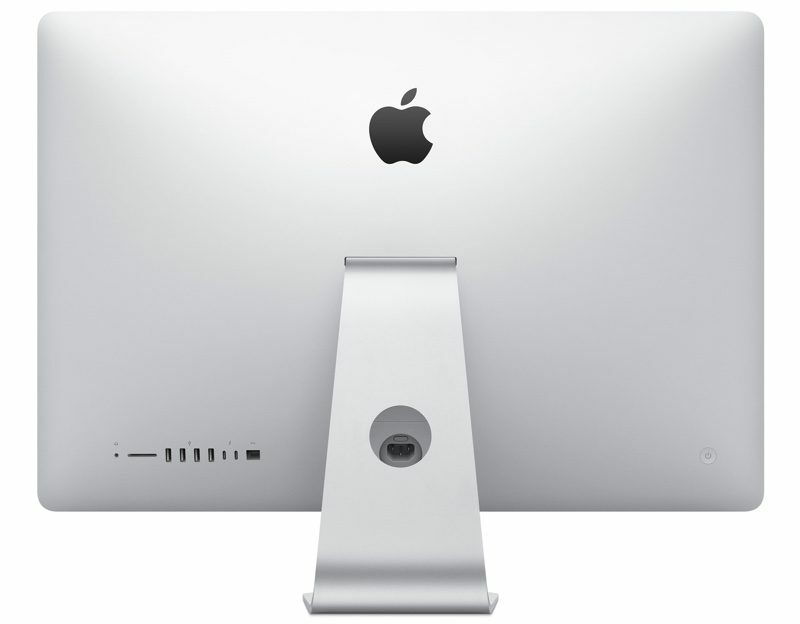 iMac models configured with built-in VESA Mount Adapters for mounting the iMac on a wall are also available separately. These machines are $40 more expensive due to the additional hardware. All 4K and 5K iMac models feature displays last upgraded in 2017 with 500 nits brightness and support for 10-bit dithering and wide color gamut. These features allow the displays to accurately reproduce up to a billion colors for more a vivid, true-to-life screen. Apple's 5K 27-inch iMac has a resolution of 5120 by 2880, while the 4K 21.5-inch iMac has a resolution of 4096 x 2304. Apple also continues to sell a low-end 21.5-inch iMac with a non-Retina 1920 x 1080 display. All of the 27-inch iMacs feature upgraded 5K displays, 1TB or 2TB Fusion Drives as the standard storage option, and support for up to 64GB of 2666MHz DDR4 RAM. 8GB of RAM is the standard in all 27-inch iMacs, so most people will likely want to upgrade this or do after-market upgrades to increase performance. All iMac models can be upgraded with faster solid state storage and higher-end processors. The 2019 27-inch iMacs come equipped with Intel's 8th and 9th-generation desktop class Coffee Lake processors, which offer decent speed improvements over the Kaby Lake chips in the previous-generation 27-inch iMac models. Apple's base 27-inch iMac and middle tier model both use 6-core 8th-generation Intel Core i5 processors at 3.0 and 3.1GHz, respectively, while the higher-end base configuration features a 9th-generation 3.7GHz 6-core Core i5 processor. The middle and high-end machines can be configured with a 9th-generation 3.6GHz 8-core Core i9 chip with Turbo Boost up to 5.0GHz. According to Apple, the new 27-inch iMac models are up to 2.4 times faster than the previous-generation 27-inch iMac models. The maximum stated performance increase is, however, based on this upgraded chip rather than the base chips in the new machines. 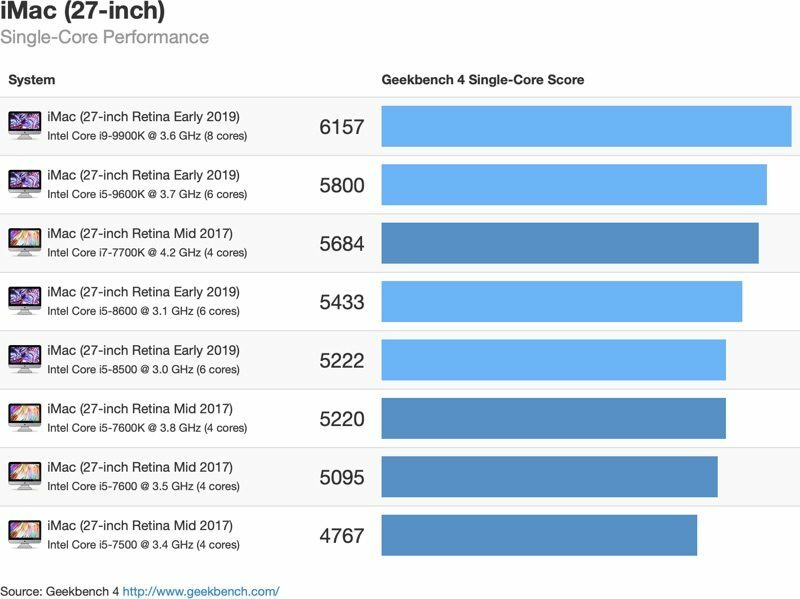 Intel's 8th and 9th-generation Coffee Lake chips bring significant performance gains to the 2019 iMac lineup. 27-inch 5K iMacs feature single core performance that's up an average of 6 to 11 percent compared to previous-generation 2017 machines and multi-core performance up 43 to 49 percent for six-core models. 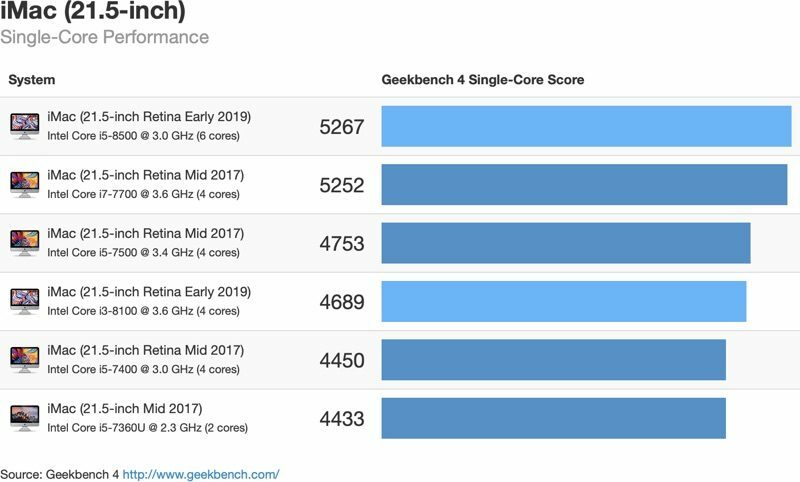 The higher-end models with 3.6GHz 8-core Core i9 chip offer the biggest boost in multi-core performance, with speeds up 66 percent faster. As for graphics, the 27-inch iMac Pro models come equipped with Radeon Pro 570X, 575X, or 580X graphics chips with up to 8GB VRAM, but there is a new option to upgrade the high-end 27-inch iMac to the Radeon Pro Vega 48 with 8GB VRAM. Apple says that the 27-inch iMac with Radeon Pro Vega 48 is up to 50 percent faster than the GPU in the previous-generation 27-inch iMac. $1,799 - 3.0GHz 6-core 8th-generation Intel Core i5 processor with Turbo Boost up to 4.1GHz, 8GB 2666MHz DDR4 RAM, 1TB Fusion Drive, Radeon Pro 570X with 4GB VRAM. $1,999 - 3.1GHz 6-core 8th-generation Intel Core i5 processor with Turbo Boost up to 4.3GHz, 8GB 2666MHz DDR4 RAM, 1TB Fusion Drive, Radeon Pro 575X with 4GB VRAM. $2,299 - 3.7GHz 6-core 9th-generation Intel Core i5 processor with Turbo Boost up to 4.6GHz, 8GB 2666MHz DDR4 RAM, 2TB Fusion Drive, Radeon Pro 580X with 8GB VRAM. Graphics, memory, and storage can all be upgraded on the 27-inch iMac models for an additional price, as outlined below. RAM is accessible on 27-inch iMac models and can be upgraded after purchase, which is worth knowing for those who want to save money on memory upgrades. A fully maxed out top-of-the-line 27-inch iMac with all available spec upgrades selected is priced at $5,249. Apple offers two versions of the 21.5-inch iMac: a $1,099 model that has a slower processor and a non-Retina display that did not see 2019 upgrades, and a more expensive 2019 model that offers a faster processor and a 4K display. The 4K 21.5-inch iMac's display has a resolution of 4096 x 2304, and like the 5K iMac, it features 500 nits brightness and wide color support for vivid, vibrant colors. A 1TB Fusion drive is the default storage option on the higher-end model, while standard hard drives continue to be available for the low-end $1,099 model and the mid-tier 4K model. All iMacs can be upgraded with faster solid state storage, maxing out at 2TB. 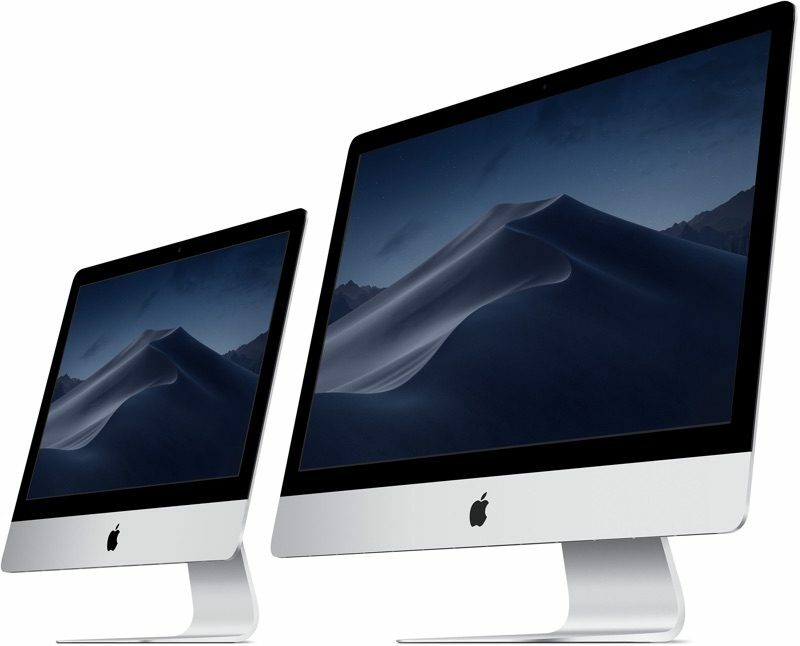 Both the middle tier and high-end 4K iMacs can be upgraded with up to 32GB of faster 2666MHz RAM, but all models ship with 8GB RAM as the default. As with the 27-inch iMac, Thunderbolt 3 is standard in the 21.5-inch machine, with two TB3 ports available alongside a range of other ports. The 21.5-inch iMac models use Intel's 8th-generation Coffee Lake chips, with the exception of the base model that doesn't have a 4K display. This machine was not refreshed in 2019 and continues to use an older 7th-generation Intel processor. As for the 4K models, the middle tier machine ships with a quad-core 3.6GHz 8th-generation Core i3 chip, while the higher-end machine has a 6-core 3.0GHz 8th-generation Core i5 chip. Both models can be upgraded with a 3.2GHz 8th-generation 6-core Core i7 chip. According to Apple, the updated 8th-generation chips in the 2019 21.5-inch iMacs offer up to 60 percent faster performance. 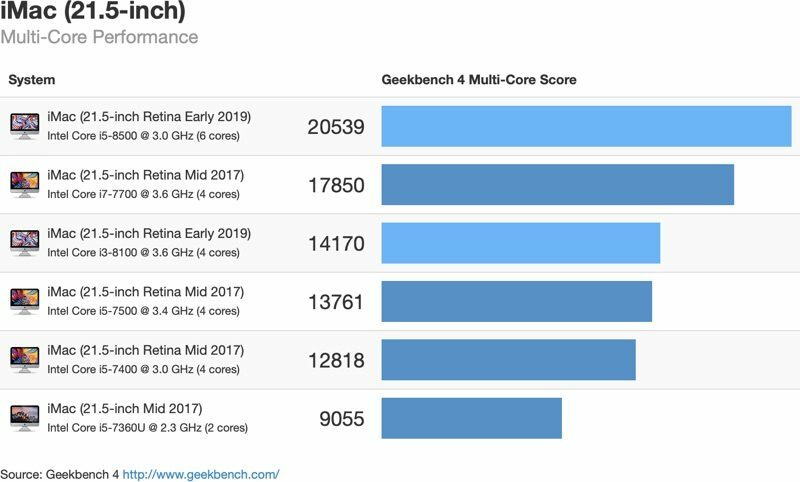 Gains are more modest for the 21.5-inch 4K iMac models than the 27-inch models, but are still significant in Geekbench benchmarks. Single-core performance is up 5 to 10 percent, while multi-core performance has increased by 10 to 50 percent. 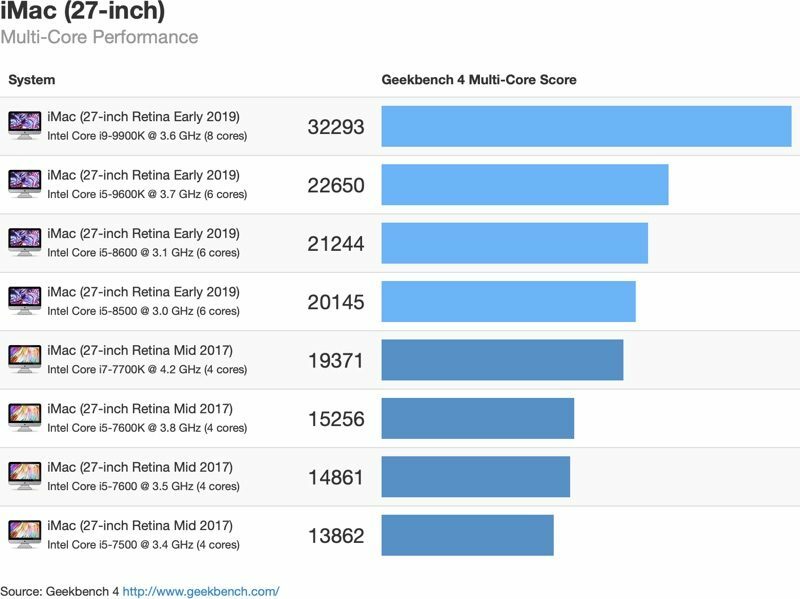 Performance gains in the 2019 iMac models are due to higher frequencies and core counts as the underlying 14-nanometer architecture has not been updated. The lower-end 4K iMac is instead equipped with a Radeon Pro 555X with 2GB VRAM, while the higher-end 4K iMac has a Radeon Pro 560X with 4GB VRAM. The higher-end model can be upgraded with faster Radeon Pro Vega 20 graphics. The lower-end non-Retina 21.5-inch iMac does not have a discrete graphics option and uses Intel's integrated Iris Plus Graphics 640. 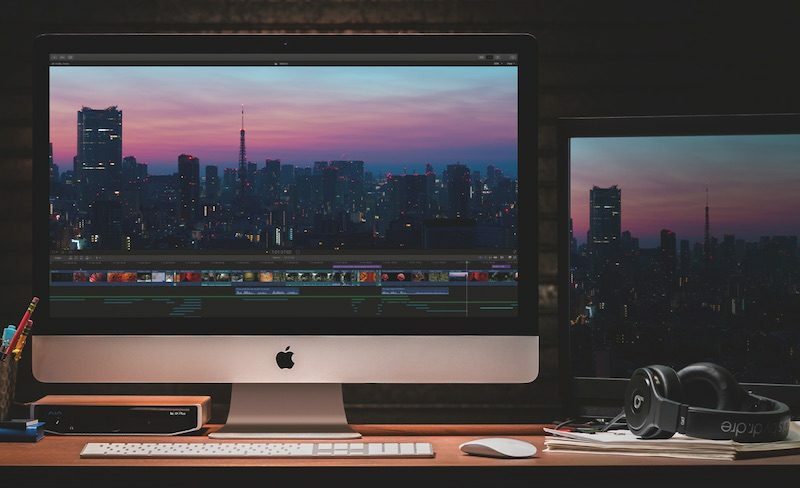 The low-end non-4K iMac can be upgraded with additional RAM and a Fusion Drive or SSD, while the 4K iMacs can be upgraded with faster processors, more RAM, and better storage options. The higher-end 4K iMac can be upgraded with Radeon Pro Vega 20 graphics. 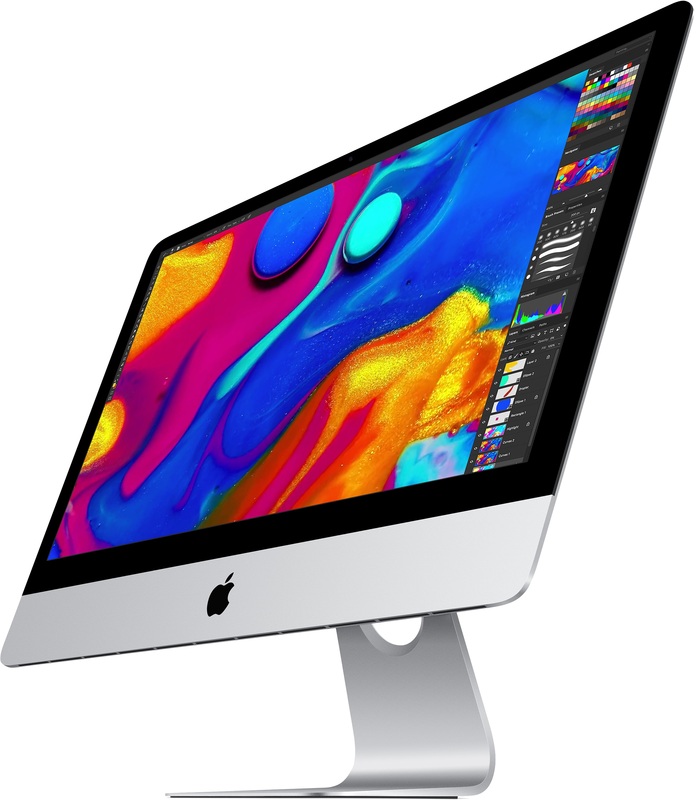 A fully upgraded top-of-the-line 4K iMac with all possible upgrades is priced at $2,999. RAM in the 4K iMac is not as easy to get to as the RAM in the 5K iMac, but it is still upgradeable post purchase. All iMac models are equipped with two Thunderbolt 3 ports that are capable of driving one 5K external display at 60Hz, two 4K UHD displays at 60Hz, or two 4K displays at 60Hz. The Thunderbolt 3 ports support DisplayPort, Thunderbolt (up to 40Gb/s), USB 3.1 Gen 2 (up to 10Gb/s) and Thunderbolt 2, HDMI, DVI, and VGA using adapters. All iMacs include a 3.5mm headphone jack, an SD card slot, four USB 3 ports, a Gigabit Ethernet port, and a Kensington lock slot. There's a front-facing FaceTime HD camera available on all iMac models with 720p video support. All models also feature stereo speakers and a built-in microphone. 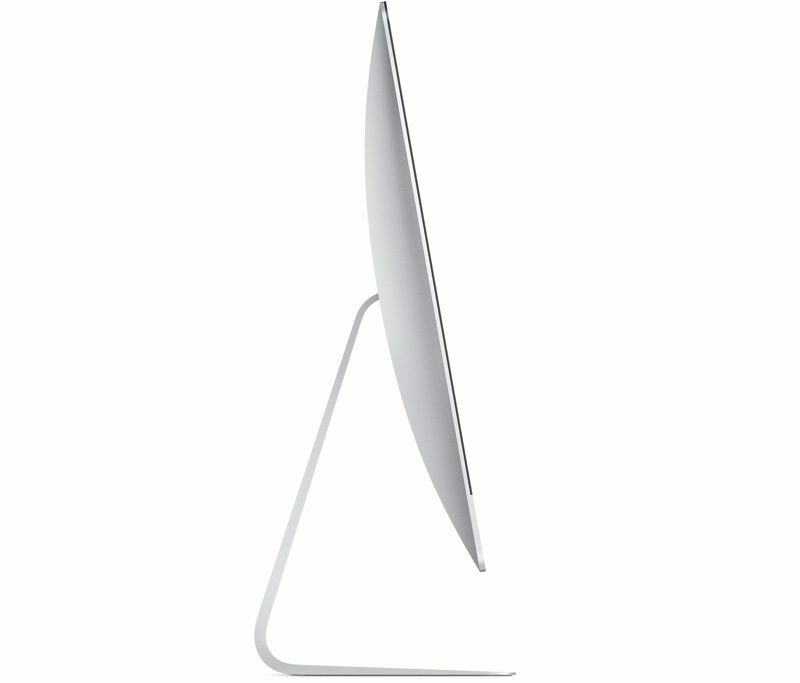 The iMac supports 802.11ac Wi-Fi that's backwards compatible with 802.11a/b/g/n, and Bluetooth 4.2 wireless technology. The new 2019 iMacs can be purchased from the Apple online store and will be in Apple retail stores in the near future. Need help choosing between the 21.5 and 27-inch iMacs or need advice on which specs to upgrade? 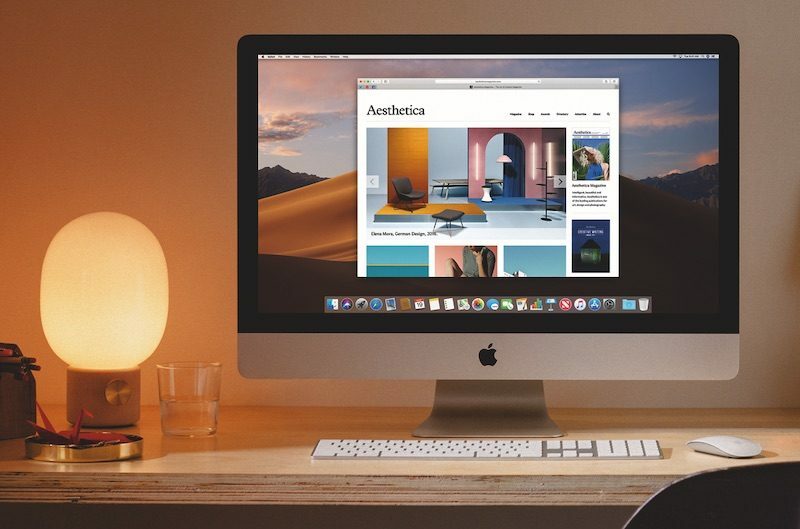 Make sure to check out our dedicated iMac Buyer's Guide, which walks through all of the available upgrades and helps you determine the ones that might be best for your needs.